You have been told you cannot settle on your Contract on the due settlement/completion date and you are going to be issued with a Notice to Complete. So, what does this mean for you? Contracts in NSW will generally have an additional condition in the Contract stating if settlement/completion does not occur on the correct date then a Notice to Complete can be issued. When you enter into a Contract to sell or purchase you will be provided with a settlement date also referred to as a completion date. This date is when you must settle/complete the Contract by. 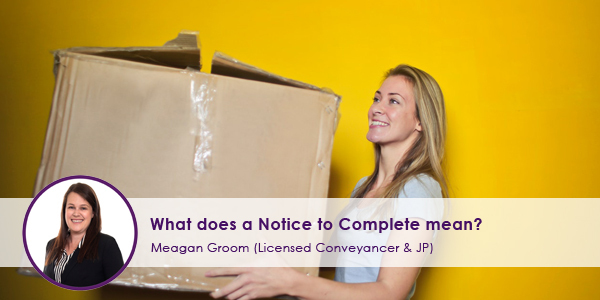 A Notice to Complete can be issued on behalf of the Vendor or the Purchaser. If, by the settlement/completion date, for some reason a party cannot settle/complete then the other party may issue a Notice to Complete. There may be many reasons settlement cannot take place, such as the bank may not be ready, the funds for purchasing may not be available, or the property is not completely vacated. The Notice to Complete will provide an additional 14 days for settlement/completion to take place within. This is an assurance for the party ready to settle that an end date is in place and pressure is on the party that is not ready. As a vendor who has issued a Notice to Complete on a Purchaser, it is at the end of those additional 14 days that you have the right to either extend the Notice to Complete period or terminate the Contract. Upon termination of the Contract you keep any deposit paid by the Purchaser and possibly sue for any financial loss/damages incurred due to the default by the Purchaser. You will then be entitled to place the property back on the market. As a Purchaser who has issued a Notice to Complete on a Vendor, it is at the end of those 14 days that you have the right to terminate the Contract, get a refund of the deposit paid, possibly sue for any financial loss/damages you may have incurred and walk away from the matter.